On my way to SPUR’s Blogging in the City event last night, a cross-dressed man boarded with a bulky roll-on luggage that was topped with yet more black garbage bags filled to the brim. He had crooked teeth and a startled, amused look on his face. As he made his way down the aisle he talked to no one in particular a little too loudly. Passengers around him looked alarmed and shrugged at one another, trying not to notice. Photo by Flickr user Poldavo. 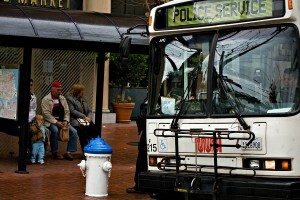 Transit News Digest: SFPD, Spotted on Muni? Nat Ford — Stay or Go? It sure was a busy weekend on the wires for transit news. While we would’ve loved to have been out in the cold, breezy sunshine, instead we were stuck indoors, with our eyes glued to the wires. Here’s what we found. SF Appeal followed up with answers to their question, Have you ever seen SFPD on Muni? The article includes an interesting field report from Steve Rhodes. And San Francisco Citizen caught wind of a wicked photo of a Muni bus that had been co-opted by the police during Saturday’s war protests. Still trying to get to the bottom of the bizarre SFPD-SFMTA-City and County of San Francisco love triangle. We’ll let you know what we and others find. Just before we left the office Friday, we noticed this article on Streetsblog, picking up on this report from The Examiner, which asks the pertinent question: Should Nat Ford stay or go? The original reporting in The Examiner’s post sounds like Ford’s departure is a done deal. It seems to us the rumors of his leaving serve as its justification at this point. Better to get someone new in who’s committed to not using the position of general manager as a stepping stone, we say. 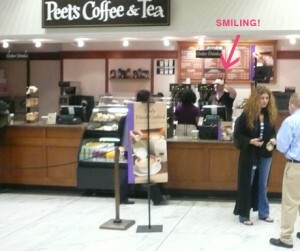 Has anyone noticed how the baristas at the Embarcadero Peet’s Coffee are incredibly friendly and nice? I remembered them being peppy. The other morning I walked up to the counter bracing myself, ready to cringe at “happy happy happy” service, but instead I was charmed. This is no Burger World. The workers at Peet’s seemed genuinely nice. Their smiles were real! They made real eye contact. They joked and teased each other. It was mesmerizing. In a silly way, it melted the grumpster in me. Cynics might say, “Wonder what they put in their coffee.” Sure, the coffee is good. But it was seeing people having a good time at work, being nice and silly to each other and customers alike that put a smile on my face. And then, when the caffeine kicked in … even the dullest doldrums in the T were looking pretty good. In our last Transit News Digest, we failed to note that former Muni chief Emilio Cruz is back at it, leading a joint-venture of that drastically underfunded Central Subway Project thingy, as reported by SF Appeal yesterday. Thanks for noticing, Rescue Muni. SF Appeal has another great piece of original reporting out today uncovering the SFMTA’s difficulties in having enough drivers on-board (ha!) to drive the allotted number of buses each day. Nice work on the article, Matt. Stay tuned, Muni Diaries readers, for your chance to ask Muni anything that’s on your mind (well, almost anything). SF Streets Blog has an excellent piece up today asking the non-rhetorical question: What can the city do make the MTA more accountable? A great read, and be sure to share your ideas with them. The Examiner digs deeper into just how much of a waste the ill-fated Culture Bus was, and SF Citizen isn’t far behind, comparing the yellow buses to NASA’s space shuttle program. Ouch! As always, if you’ve got tips, suggestions, or diaries of your own, send them our way. Silly me, posting a news digest before 1 p.m.
Update: Just learned that BART directors will a presentation Thursday (March 12) on the agency’s Fiscal Year 2010, assuming it will have one. It expects a $49.3 million deficit next year. Original post: Earlier today, Greg Dewar posted a quick hit asking for details on a Muni slowdown. Good luck getting that, Greg. If you, dear reader, know of anything, let us know here or on Twitter, or drop Greg a line. Nascent online-news site SFAppeal catches us up on just how badly the budget numbers will impact plans for the Central/Chinatown Subway project. It doesn’t look good. Per that report last week that Muni managed to boost its on-time rates, The Examiner has a theory as to how it happened — discipline from on high. We’d sure like to see a Muni driver slapped on the wrist with a ruler next time he or she starts a route early. Oh, and be wary until about 4 p.m., as Muni is advising of delays in downtown San Francisco due to a demonstration. And to leave you on a high note, SFist spreads word of a TransLink party along Market on March 22. Sounds deliciously deviant and painfully fun. If you’ve got news tips or stories you’re dying to tell, let us know. And Happy Tuesday! The Examiner reports on Nathaniel Ford’s stating of the obvious: that service will suffer due to a deteriorating fleet of buses and trains if millions aren’t found in funding to shore up the vehicles. Millions as in more the $680 of them. $680 million. In this economy? The non-Chronicle, soon-to-be biggest daily in town also reported on Muni’s hiring of a new safety head. As rnaglejr responded when we echoed the news over on our Twitter feed, “yeah, well, what about the reliability chief? Still waiting on that hire.” So are we, Rob. ABC and others tell us that yesterday’s Fruit(less)vale BART station protest was largely uneventful. Oh well, we’re sure there will more attempt to make the innocent suffer with BART delays and station shutdowns to come. 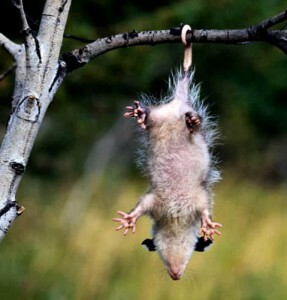 And we leave you to the weekend with this week’s humorous and tragic monkey business, as an opossum apparently caused major BART fuckery on Tuesday. Ouch. If you’ve got news tips for Muni Diaires, or, you know, Muni diaries, send them our way. Or follow our Twitter feed for more immediate BART and Muni news. Have a great weekend!